The new specs for the PS4 seems to turn the playstation into a PC, except for the special memory thats runs much faster than a typical PC. The PS3 was based on IBM's Cell processor, that was hailed at it's debut, but turned out to be a problematic to program and hotter than an oven. The PS4 changes all that with X86 technology that most game developers like to work with and is a standard in the PC gaming community. Every part of the playstation has been upgraded to be up to 16 times faster. Connectivity with iPhones/iPads/androids and sharing has been added, an extra CPU is included to do downloads and other tasks at the same time your playing a game, in fact you can start to download a game and begin to play it before it's entirely downloaded. Other possibilities are picture in picture and previewing an opponent's "best of" video clips before the match begins. Playing the PS4 at work through your smartphone by controller and video streaming? 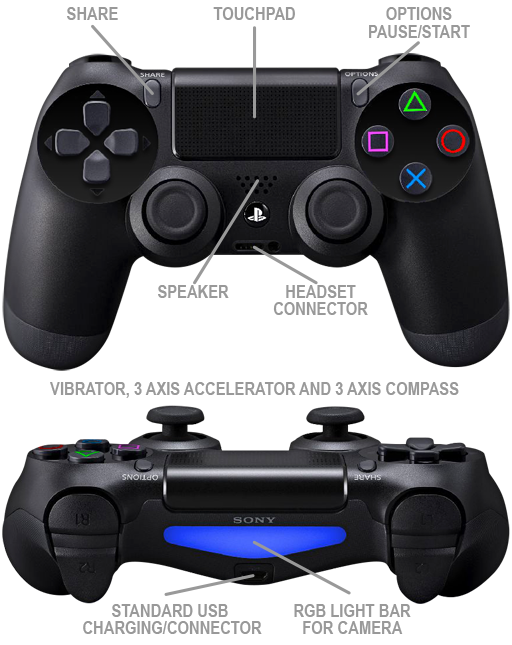 The controller has much more sensors and feedback controls than you can shake a stick at. To me it looks like the touch pad is in an awkward place, you'll probably swipe it to pull a pin on a grenade and so forth. There's a share button (something I would never touch) and the options button does double duty for pausing and starting. A mono headset comes bundled, so everyone will have a mic, stereo headsets will be available. You'll be able to recharge the controller with any usb charger, and the multi-colored light bar helps the camera or 3D positioning as well as indicating to the gamer their health is low by flashing red. The button and trigger quality has been improved. So why buy a PS4 when it's basically a low priced PC, why not just buy a PC? I'll have to wait and see more of the PS4 can do, before thinking of buying a $1500 PC. It'll be interesting to see a comparison of the new Xbox when specs are released. I don't see why you have to be a d-ck, this is a pretty decent thread, a lot better than many others that get started here on a daily basis. It's a playstation thread, comparing current and next gen playstaion, why would it belong in SW? I really want to get my hands on that controller. 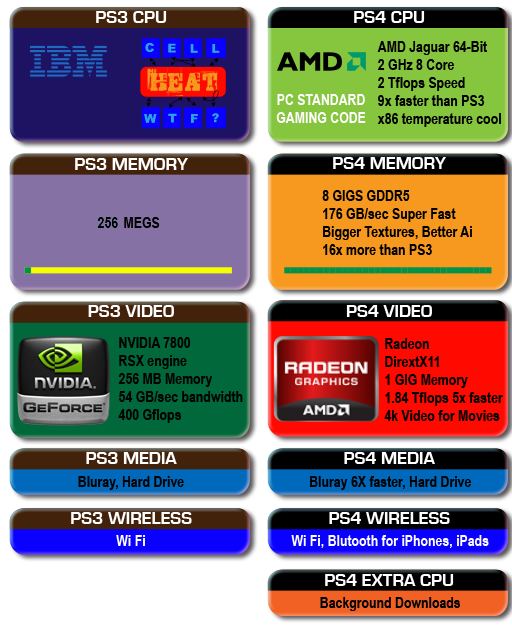 i though the ps4 had a hd 7850 in it A 7670? that's going to hurt next gen lol. Also the ps3 had 256 mb system memory. The ps3 was a lot more impressive for it's time though, 8 cores , and the latest gpu. Not the case with the ps4 though, bad idea. This isn't system wars material and belongs were it is. Also, he doesn't have to be level ten to create a thread unless you mean in SW.
[QUOTE="evildead6789"]i though the ps4 had a hd 7850 in it A 7670? that's going to hurt next gen lol. Also the ps3 had 256 mb system memory. AMD has confirmed that PS4 will be using 2013 road map building blocks i.e. 7670 is not part of it. Not really diggin that new controller. Looks unpleasant to look at and less comfortable than the last Dualshock. PS4 definitely sounds so awesome! Why get a PS4 over a PC? PlayStation exclusives are pretty much the only reason I'm still playing games these days. I'm not even talking about stuff like God Of War, Gran Turismo, Little Big Planet, Infamous, etc. I hope they still have an ethernet port on the console, video game consoles normally cannot connect to my University Wi-Fi. bad attitude, no need to be a jerk. also, this thread isn't sw material, its' about ps3 to ps4, not 360 to ps4 or 720 to ps4 or wii u to ps4. tc : nice thread and pics. thank you for posting. informative. no, i'm 6foot five inches, no way is that accurate. xbox is for alien, awkward thumb placement hands, dualshock is for human symmetrical hands. easy to counter, thanks. agreed. I like the info graphics too. monsier guy is a sw xbox troll, if memory serves. he mad ps comparison isn't negative. Very well done thread, love the comparison pics. Good job OP. I can't wait for PS4, much more powerful than PS3. I am hyped. Sad pathetic troll attempt is sad pathetic troll attempt. I'm not seeing how it's a step backwards, it seems like a major leap forwards to me. It may be a step backwards from the $1000+ gaming computer you have, but for a console it's packing some serious power. yes it sounds real sweet. has anyone else put there ps3 on after hearing about the ps4 and just thought i just can't be bothered truly playing on this anymore and i want the ps4 NOW hahahahaha i'm like a big kid, i put fifa in and just thought, truly how much better are the graphics going to be than this. i always do this when i know the new system is around the corner i get bored of the current system and my mind is set on the new system. Stop acting like a baby. Your PS4 is just a meager PC. My PC has a blue ray burner and solid state drives, and I can upgrade it anytime. Have fun with your new budget PC build I guess. Why do you only play fps? I grew up playing Counter-Strike, Unreal, and Quake. I tend not to like to problem solve/explore when playing games. I just like to shoot stuff. My friends bought me LA Noire for my birthday a couple years ago and I didn't even finish it. I had Zelda Twilight Princess for Wii and didn't finish it. So I guess this year I'm going to get some used PS3 games and pick up some titles I missed on before getting the PS4. Major fail is you. The chip size for Intel i7-980X is quite large i.e. 239 mm^ while Radeon HD 7870's chip size is 212 mm^2. AMD Jaguar core size is 3.1 mm^2 + 2.1 mm^2 for L2 cache i.e. total size of ~41.6 mm^2. The reason why Intel i7-980X's large chip size is due to slower DDR3 memory i.e. larger on-board cache. Fast GDDR5 memory reduces the need for large chip size. There's very difference between NVIDIA's OpenCL and CUDA. PS, Sony PS4 would not be using Microsoft's Direct3D stack. App 1. Digital Hydraulics code is all about basic floating point arithmetics, both algebraic and transcendental. No dynamic branching, very little memory traffic. App 2. Ambient Occlusion code is a very mixed load of floating point and integer arithmetics, dynamic branching, texture sampling and memory access. Despite the memory traffic, this is a very compute intensive kernel. App 3. Running Sum code, in contrast to the above, is memory intensive. It shuffles data through at a high rate, not doing much calculations on it. It relies heavily on the on-chip L1 cache, though, so it's not a raw memory bandwidth test. App 4. Geometry Sampling code is texture sampling intensive. It sweeps through geometry data in "waves", and stresses samplers, texture caches, and memory equally. It also has a high register usage and thus low occupancy. Dirt Showdown's results mirrors "App 2" results. I imagine that would be a huge amount of data to have to render. Even if the tvs are affordable, the real bottleneck is keeping the fps high and stable. Personally, I think I'd prefer 1080p at a stable 60fps before 4k at an unstable 30ish fps for gaming. There's not much to complain about, just... why did they put a speaker on the controller? The Wii did that and the speaker just sucked. Really tinny and wasn't used to much good. One of the things I am scared of with the PS4 is really expensive controllers. I think no more than $60 for a controller, please. Nice post, loved the specs comparison. I think gamers play on consoles because they think that PC gaming is hard to set up and tend to shy away from it. If I have Battlefield 4 for PS3 and my friend has Battlefield 4 for PS4, will we be able to play together online? Forgive me if this was already asked ...WILL THE PS4 be compatible with existing PS3 games? no they. Won't work just keep your ps3 and you be fine.